If you own a car, you have probably discovered a mysterious puddle under your vehicle at one time or another. Cars are chock full of various fluids, all of which are capable of dripping from the vehicle onto your driveway or garage floor. Of course, if you discover a leak, you definitely do not want to ignore it. While there are instances where dripping fluid is normal and natural, there are other cases where it’s a red flag that something is amiss. In order to help you determine what might be causing it, let’s start by looking at the various fluids that may drip from your car, and then examine why they are dripping in the first place. Coolant: while it used to be green in most cases, it now tends to vary by the make of the car. If you are unsure, give your mechanic a call. On a hot day, when your car’s A/C is busy keeping you cool as you run your errands, the unit has to find a way to get rid of the moisture it is taking out of your vehicle’s interior. To do this, it will drain the H2O on the ground through a hose, which is usually beneath where the front passenger sits. If you see clear liquid dripping from this area of your car on a warm day, chances are very good that this is a normal and desirable thing and nothing to worry about. While water leaking from an A/C unit is a good thing, the other aforementioned leaks are not. As Gold Eagle notes, ignoring that puddle of oil under your vehicle is not a wise idea, as it can lead to serious engine damage. The vast majority of oil leaks happen because of degraded engine gaskets, oil seals, oil pan leaks and a faulty crankshaft seal. One important note, while brake fluid is a relatively rare leak, it is very close in color to motor oil, so you may not want to assume that the amber drips are from oil. An improperly sized o-ring may be the cause of brake fluid leaks as well as some other types of drips in cars; if you are an auto repair DIYer, check out the huge selection of o-rings at Apple Rubber; they feature a handy search tool that allows you to find the exact one you need from their inventory of over 7,000 sizes. As for coolant, it can come from the wide variety of hoses that surround the engine or the radiator, which is right behind the front grill of your vehicle. 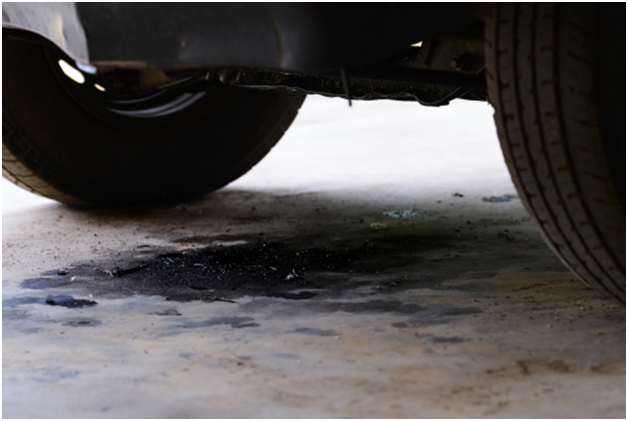 In the case of transmission fluid, the most common leaky spot is an axle seal on a front-wheel drive car or the output shaft seal on a real-wheel drive vehicle. If you suspect a power steering fluid leak, check each end of the steering rack, as this is the most common place it will leak. For the gear oil, it can come from the wheel bearing seals, rear axle seals or standard transmission. It is reassuring to know that not all leaks are huge emergencies. Water coming out like a faucet under your vehicle is probably okay. Spotting amber, red or viscous honey like liquid on the garage floor, not so much. By acquainting yourself with the colors of the most common fluids as well as the typical sources for these leaks, as well as stocking up on parts you may replace yourself like o-rings and the like, you can keep your car in safe working order.